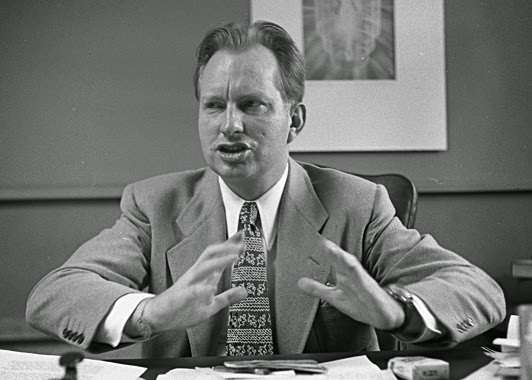 A Modern View: Who was L. Ron Hubbard? Supposedly, he holds a Guinness World Record for the number of published books by one author in a lifetime. The consensus is that he was a prolific fantasy author, some of which is known as science fiction. And that is just what doomed his legacy. Because the "facts" spread about his life, even from his own words, are indistinguishable from his fantasies. His "church" was reportedly created with the purpose to make him money - and he died rich (and alone.) The current controversy about how that organization mis-treats its members ("Going Clear") is his real legacy. The policies he wrote, mis-applied or not, set the scene for these tragedies. The PR his devoted followers have spread is based on his own fantasies. If you run into his fiction works, enjoy them if you can. If you run into something "factual", it can always be chased down as being stated by someone else - and rarely attributed. The one real result I've gotten from following his texts on philosophy is the personal discipline of always researching to discover the real sources of his techniques - to find the underlying natural laws which made any of his successes possible. An interesting sidebar: while Hubbard left deeded his copyrights to no one in his will, his family isn't interested enough to try to defend them. The corporation has had to re-write those books - which now have "by L. Ron Hubbard" in the title, and the new copyright owner is "L. Ron Hubbard Library." The bottom line is that his techniques only work inside the fantasy world he created - which is why the work to get these applied in the society at large have failed. A person needs to buy into that fantasy to get the benefits. Hubbard wrote nothing original except his fantasies. All of his "secret upper levels" are far more fantasy than fact. Building upon the idea of "past lives" is setting your foundation on quicksand. There is no science to routinely prove it - because people re-write their own lives as they live it. In a society where Science rules, nothing which isn't factual can be proved or "validated." After 20+ years in that group and around 15 years out of it, I occasionally still have nightmares. They all have to do with the extreme control methods which were used inside that organization. Reportedly, these have gotten much worse in the 15 years I've been gone - and the reason I left was because in general, people were afraid to apply the policies as written if they conflicted with Miscavidge "command intention". This also then casts shadow on those policies, as that corporate culture was responsible for creating Miscavidge, who joined as a teenager. What I've learned to deal with these nightmares is to go back into that dream and leave that group. It's the only thing which turns it off. It's what I did so long ago, and it's what I recommend to anyone who has ever been in it. Fantasies don't have to be believed. You may or may not get gains from the practices he laid out. Those gains you've had are yours - they cannot be taken away by anyone else. Your gains are the result of your own personal exploration and self-adjustments. If you see "L. Ron Hubbard" as a byline - consider it pulp fiction. If you see that on something purported to be factual and seems to be useful - take only that datum and then thoroughly research to find out who said it much earlier, and how they actually applied it. Then quote the original author, not the fantasy.